1. A non-profit organization called BoxWorks, Inc. is using shipping containers to build schools, community buildings and houses throughout the developing countries. Abandoned containers are readily available all over the world. They can be purchased inexpensively and hauled to the desired location via local trucks or railroad. Native workers can use simple tools readily available to punch out doors, windows and walls, combine several containers into one or more rooms, roof with recycled sheet metal or other material, and complete the building with time and cost required. In a YouTube video BoxWorks officials, working with Habitat for Humanity in Haiti estimated that a building project would take only 11 days to complete using shipping containers. 2. A Travelodge Hotel using converted shipping containers recently opened in Uxbridge, UK. The 86 containers were arranged in honeycomb fashion several stories high to form the 120 room hotel. According to the Wall Street Journal (August 27, 2008), the hotel rooms were outfitted in China before the containers were shipped to England. Instead of taking 15 months to build, the project was completed in just 4 months. Travelodge has an ambitious building program underway, and it is anticipated that converted containers will figure in cutting costs and time for some of these projects. A similar 310 room Travelodge is in the process of being built near Heathrow. 3. One of the larger container manufacturers, Sea Box, Inc., refits shipping containers as mobile logistics centers for each of the branches of the U.S. military. They have also designed and constructed military hospitals and training centers with the containers. 4. Sea Box, Inc. also has a prefabricated “Box Office” kit. The 20 x 8 foot container comes pre-equipped with flooring, electrical, insulation, and refrigeration, built in windows and a door, and drafting tables. They can be assembled quickly without outside assistance in many cases. 5. Shipping containers are being used to store emergency supplies at staging centers around the U.S. run by Red Cross. 6. Several architects and builders around the country are using converted shipping containers to create modernistic, custom-designed homes for prices that are more like those of tract homes. 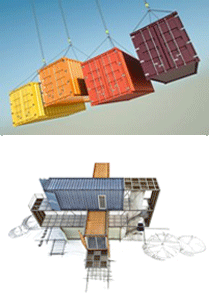 Depending on the location, a 1600 to 3000 square foot home may be built using containers for $133-$180 per square foot. Using traditional building materials a custom home normally costs $200 to $300 per square foot. This innovative building material also requires much less time to complete than traditional materials.